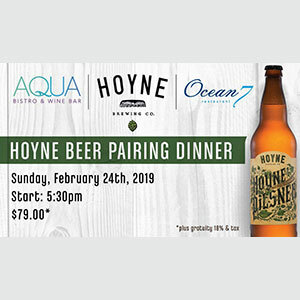 Join Executive Chef Richard Benson and Carolina from Hoyne Brewery for a 4-course beer pairing dinner served at a long table at the Kingfisher Oceanside Resort & Spa. Cost is $79 per person plus gratuity and tax. There’ll be a round-trip shuttle available for $10, as well as special guest room rates for those who want to make a night of it.